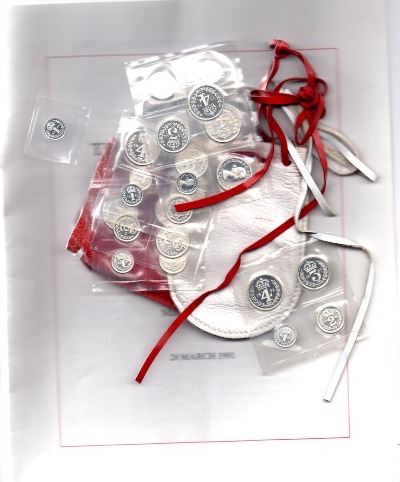 We detail below some of the "FULL DISTRIBUTION" sets of Royal Maundy which were issued to the maundy recipients. These are from our personal collection. All contained in a lovely wooden case made specifically by Ted Carey for this maundy distribution. The maundy recipient was Emily Miles Nee Mousher. We also have two entry tickets for this 1961 service as you will see below. 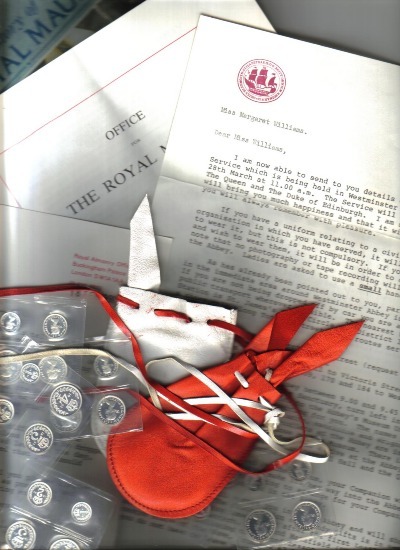 10th March 1966 - A three page letter advising applicant has been succesful in their application to receive Royal Maundy gifts. Signed by Peter Wright Secretary of The Royal Almonry. Undated Letter - Desribing The Royal Full Maundy distributions. Envelope - Addressed to maundy recipient. 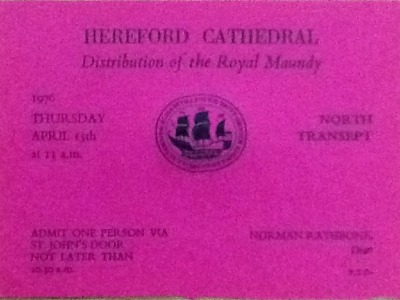 Entry Ticket - Ticket allowing Mrs A Hoadley and companion to the maundy service on 7th April 1966. Programme - Giving full details of order of maundy service - hymns , prayers etc. The Pictorial History of Royal Maundy - colour booklet by Pitkins. The maundy recipient was Mrs A E Hoadley. "For the redemption of the Sovereigns gown, worn on the day of distribution - 5 x £1 notes. White Leather Purse - contained Maundy Money. As many pence as the Sovereign is years of age (47 pence). 4 Full Maundy Sets plus extra 3d and 4d. Official Maundy Case with Royal Crest in silver. 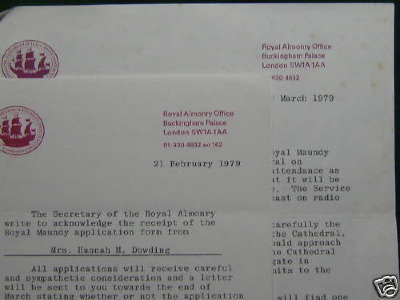 17th February 1973 - letter acknowledging receipt of Royal Maundy application form from Mrs B.C. Botwright. 26th March 1973 - 2 page letter informing Mrs Botwright of succesfull application and detailing the arrangements for theMaundy thursday service on the 19th April 1973. This is signed by Peter Wright Secretary of the Royal Almonary. UNDATED letter - describing "The Royal Full Maundy" describing both the first and second distributions. 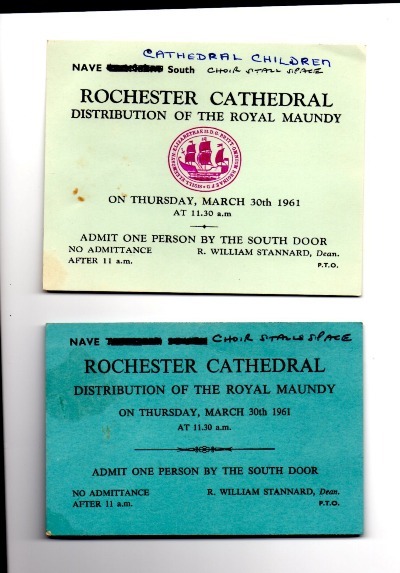 19th April 1973 - Ticket (Green) to admit MrsBotwright and companion to the Maundy ceremony. 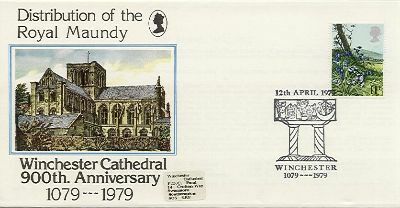 June 1973 - letter thanking recipient for letter regarding Maundy ceremony. Signed by Peter Wright. 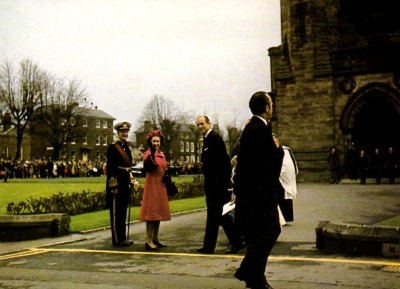 There is also a booklet showing the 1973 Maundy ceremony on the front cover - "The Pictorial History of the Royal Maundy" by Peter Wright. The Maundy recipient was Mrs B C Botwright who was one of only 47 men and women to receive the Royal Maundy distribution in 1973. Coins and banknotes in uncirculated condition with light toneing. Purses etc in good condition. 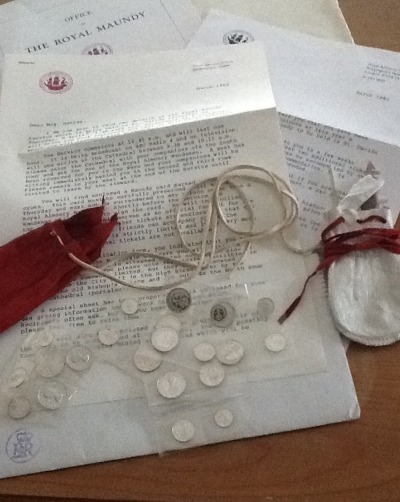 Photo of some of the 1973 letters, ticket & purses. 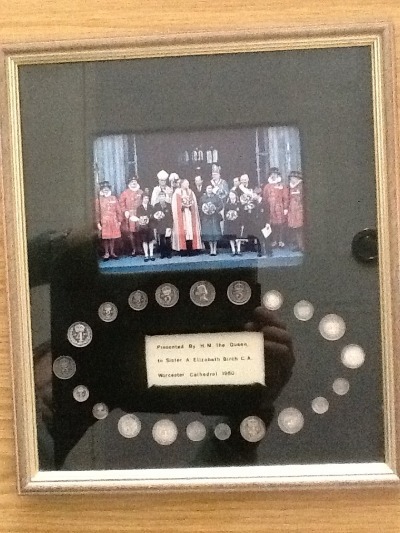 Photo of the Royal Maundy box / other coinage mentioned above. Red - white string, white - red string, white - green string leather purses. 6th February 1974 - letter from Royal Almonary Office acknowledging receipt of application form for Royal Maundy service. March 1974 - letter from Royal Almonary confirming Mr Purchase successful application. Signed by Peter Wright Secretary. Plus envelope addressed to Mr Purchase. 11th April 1974 - Ticket, white to admit Maundy companion. 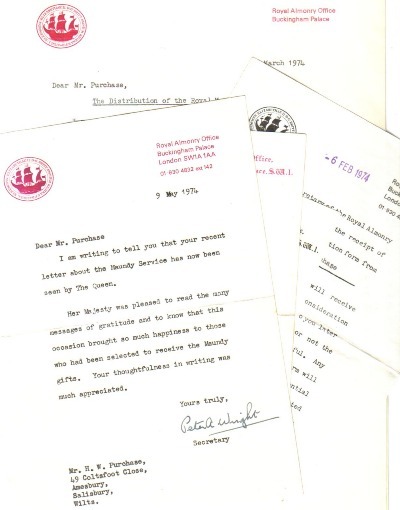 9th May 1974 - letter from Royal Almonary thanking Mr Purchase for his recent letter about the maundy service. Signed by Peter Wright secretary. Undated letter - outlining the maundy distribution and gifts. Undated letter - notes about the Royal Maundy and King Georges Jubilee trust. 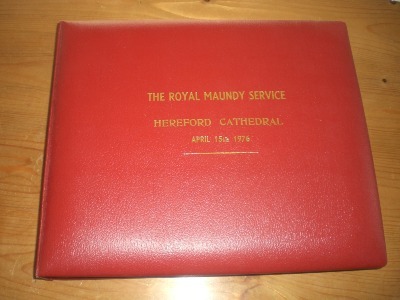 Official Booklet describing the 1974 maundy service including hymns etc. Booklet "Royal Maundy" - The pictorial history of the Royal Maundy by Peter Wright. The maundy recipient was Mr H W Purchase. One of only 48 men and women to receive the Royal Maundy distribution in 1974. Leather photo album containing photos from the ceremony. Red and Green leather purses. Original programme from 1979 service. March 1982 - Letter confiriming chosen from Peter Wright Secretary in original envelope. March 1982 - Letter confirming details of the ceremony in original envelope. Signed by Peter Wright. "Maundy money, as many pence as the Sovereign is years of age" - (60 pence). 6 Full Maundy Sets - still in sealed in transparent holders. Official Royal Maundy Case with Royal crest. February 1986 - Letter informing recipient of succesful application and detailing arrangements. Signed by Peter Secretary. Undated Letter - Enclosing the Royal maundy service book. Undated Letter - Enclosing notes for recipients regarding the Maundy service programme. 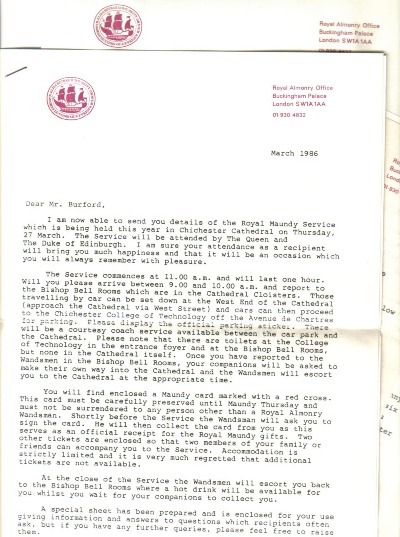 27th March 1986 - Signed letter by Peter Wright, Secretary of the Royal Almonary detailing the maundy service at Chichester Cahedral. 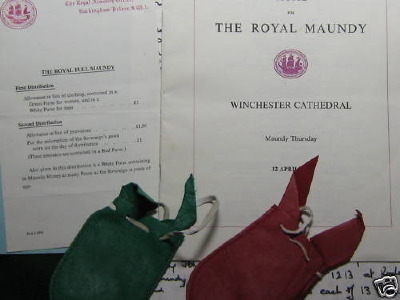 Two official booklets describing the 1986 Maundy service including hymns etc. Booklet - "The Pictorial History of The Royal Maundy" by Peter Wright. Blue Folder embossed with crest of Chichester Cathedral. Maundy recipient was Mr H K Burford, one of only 60 men and women who were given the maundy distribution in 1986. All coins are as struck and still sealed in their original official containrs. Purses are in good condition also. "Allowance in lieu of clothing"
"Allowance in lieu of provisions"
White leather purse holding the maundy money, as many pence as the sovereign is years of age (65p). Official programme for the 1991 service. The Story of The Royal Maundy booklet by Pitkin. 12th February 1991 - Letter from the Royal Almonry office acknowledging receipipt of the application form. 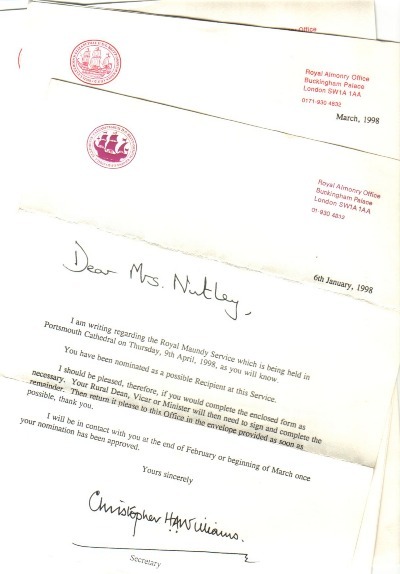 18th February 1991 - Letter confirming that Miss Williams has been chosen to be a maundy recipient. March 1991 - Letter confirming details/information for the day tgether with notes for the maundy recipients. 3rd May 1991 - Letter from the Royal Almonry office acknowledging receipt of a letter from Miss williams which they have passed to the Queen. The maundy recipient was Miss Margaret Williams. 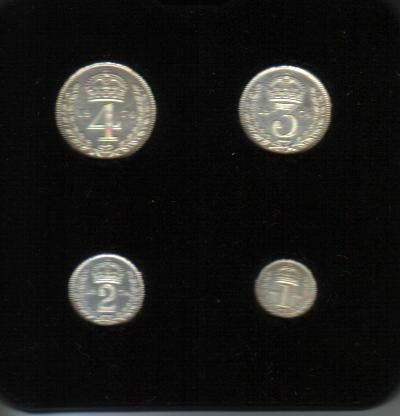 All coins as minted in their sealed plastic packets. Maundy recipient was Gwendoline Fullwood. 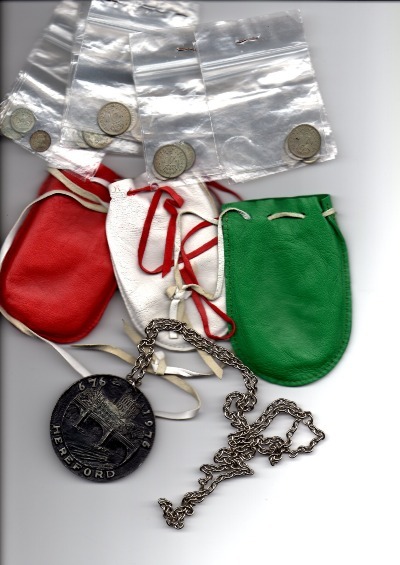 White Leather purse containing: Maundy money, as many pence as the Sovereign is years of age (72 pence). 7 Full maundy sets and two extra 1d coins. 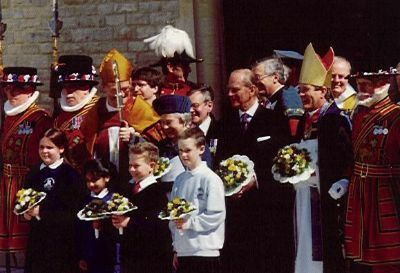 Official Booklet describing the 1998 ceremony at Portsmouth Cathedral. 6th January 1998 - Letter from Royal Almonary advising of nomination as possible recipient of maundy money on the 9th April 1998. Signed by the Secretary Christopher Williams. Wth original Buckingham Palace envelope. 31st January 1998 - Letter from Royal Almonary acknowledging receipt of Royal Maundy application form. With original Buckingham Palace envelope. 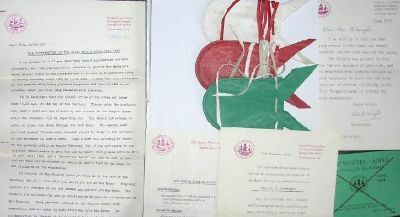 March 1998 - Letter from Royal Almonary informing recipient of succesful application and giving details of the ceremony. 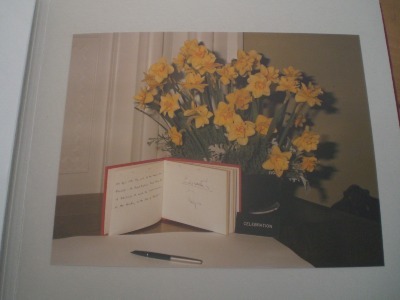 Signed by Christopher Williams Secretary. Undated Letter - From the Royal Almonary detailing the Royal Maundy Distribution and gifts. Undated Letter - From Royal Almonary with notes about the Maundy service. 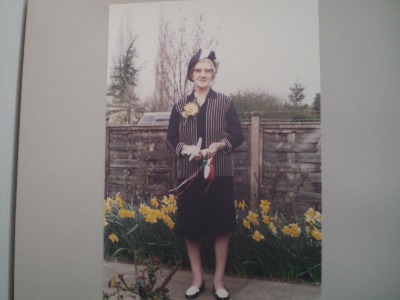 Maundy recipient was Mrs Alice Nutley, one of only 72 men and women to receive the maundy distribution in 1998. 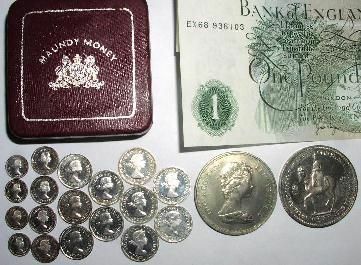 All coins as struck and the maundy sets are still sealed in their original transparent holders. Purses in good condition. 12th January 1999 - Letter confirming nomination. 26th January 1999 - Confirmation of nomination form received. 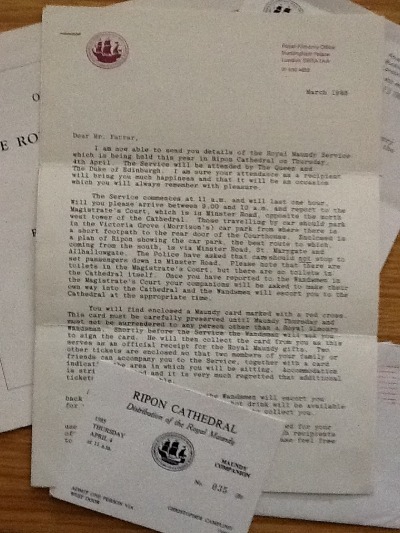 March 1999 - Confirmation that recipient has been selected. 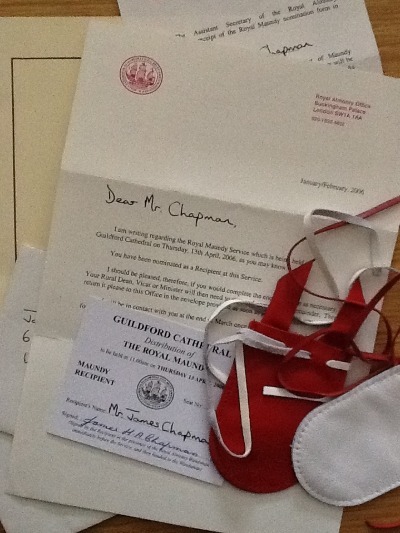 Entry ticket - For maundy companion in envelope from Buckinham Palace. Programme - Giving full details of order of service. White leather purse containing: 7 complete maundy sets and a 3d and 1d. As many pence as the sovereign was of age - 74. Service programme for the distribution in 2000. 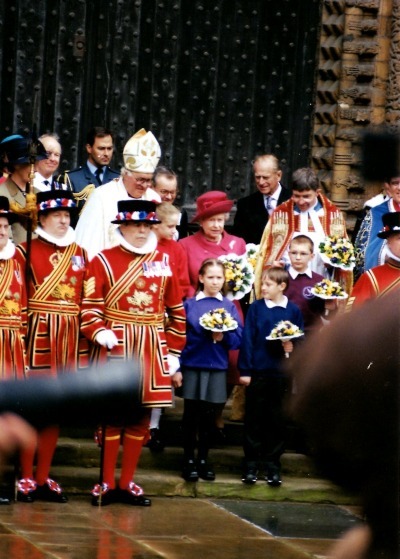 Queen Elizabethh II at the maundy ceremony. Maundy recipient was John xxxxxxxxx in 2000. Programme - Giving full details of the order of service - hymns, prayers etc. The maundy recipient was Walter Nindi. Letter to Mr Chapman confirming nomination. Confirmation from Peter Hartley Assistant Secretary that Mr Chapmen was succesful in his application. 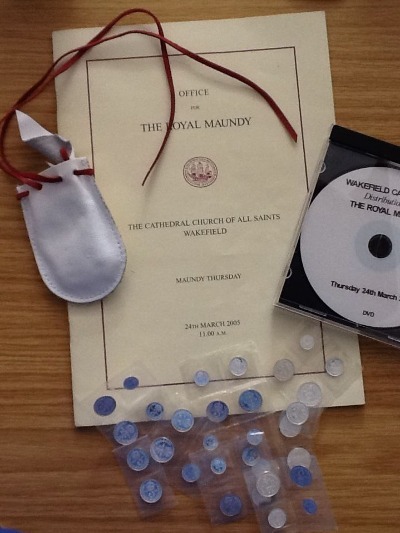 The Royal Maundy service programme. Original pass signed by Mr Chapman - this should have been handed to the wandsman at the ceremony - therefore rare to see. Maundy recipient was Mr James Chapman.